Cottonbloom is the perfect place for starting over, finding your way back home–and falling head over heels. . .
Ella Boudreaux has a lot to prove to her family, friends, and foes–and to herself. So when her marriage ends she decides to invest her energy and money into a place that brings back some of Ella’s happiest memories: the Abbott brothers’ garage. Maybe, if she puts her mind to it, she can teach skeptical, stubborn Mack Abbott how to make the business a true success. Which would be a lot easier if the hunky mechanic didn’t make her motor run quite so fast…and hot. Mack was furious when his brother, Ford, sold his share of the business. He’s in no rush to team up with a wealthy divorcee who shows up to the garage in stilettos–and the longest, sexiest legs he’s seen in forever. But Ella’s grit and determination won’t quit…and soon Mack can see that she’s been down a few rough roads herself. Neither Mack nor Ella can deny the fierce attraction that’s revving up between them. Could it be that true love has been in the backseat all along…and they’ve finally found the key? 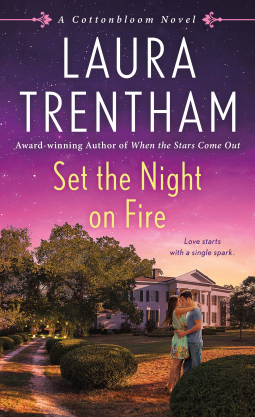 Set the Night on Fire by Laura Trentham is an exciting romantic read. I loved the fierce protectiveness that Mack feels towards Ella. At first, he didn’t want her anywhere around him, but getting to know her changed all of that. Her determination sparked a fire inside of Mack. One that he tried to diminish but was helpless in shaking off. His attraction towards the beauty only increased. As other characters from the previous books and new ones came onto the scene it only sparked more of an interest to keep on reading. I ended up finishing the entire read in one sitting. Fast-paced packed with action, hot scenes, and humor to make the pages fly by…I was impressed. Laura Trentham’s latest novel, wasn’t just a hot romance that I could not put down. It went deeper than that. It displayed the family and marriage abuse that Ella went through in her life. It gave me a glimpse into her loss. Losing a family member is never easy. The car mechanic garage meant and reminded Ella of her older brother. It was sentimental value to her. Plus, the brothers that worked it became like family to her. Despite what hell life brought to Ella, she bounced back. She became stronger and more independent. But she was also able to put some trust into the tough as nails mechanic aka Mack. Mack has his own personal struggles as well. I loved the depth and meaning this book brought. It was more than just a romance. It was life. Overall, I would highly recommend this romantic story to all readers.